Are Rich Investors About to Get Crushed? No, I’m not talking about you, Rich Investor readers. I’m talking about individuals with huge stock positions. We’re quickly closing in on the longest bull market in history, and it’s been a great ride. Unfortunately, with investors and speculators leaning so heavily to one side, it could get nasty when the worm turns. 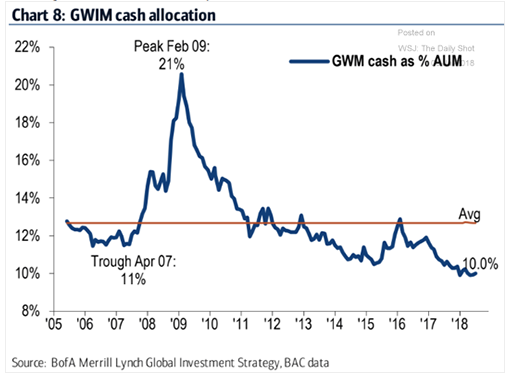 Merrill Lynch recent published a report indicating that its wealthiest clients’ cash positions as a percentage of their assets under management are at a low for this cycle. Private clients (aka rich folks) hold their lowest cash position since just before the financial crisis. You know, the one that turned a lot of 401(k)s into 201(k)s. Then, when the market bottomed, investors were flush with cash. Given their track record, I would consider private-client cash positions to be a contrary indicator. That means it’s time to get cautious. Since cash positions are at lows for the cycle, that means investors are, well, fully invested. There’s little fresh capital waiting in the wings to buy stocks and boost prices. Everyone’s loaded to the gills. 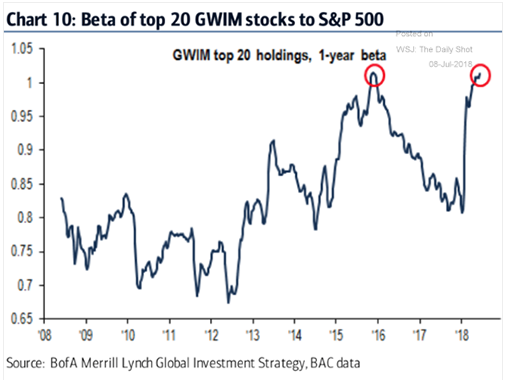 The beta, or the “juice” of their portfolios, has revisited the peak for this cycle and is at a much higher level than just before the 2008 crash. A beta over 1.0 means that a portfolio is likely to make disproportionately large moves relative to the market. Back in 2008, the beta of private clients’ top 20 stock holdings stood at about 0.85. Now it’s over 1.0. That means you can expect losses to be magnified. Additionally, everyone owns the same stocks because of substantial inflows into market index funds. That means there will be nowhere to hide when the reckoning comes. Market valuations are stretched. Volatility is low. Investors are fully loaded into aggressive stock positions. Now’s not the time to have your head in the sand, even if you like the view. Last week, National Beverage (Nasdaq: FIZZ) shocked the market by announcing it received a Securities and Exchange Commission (SEC) inquiry into a couple of “unique” financial metrics the company uses to measure sales performance. National Beverage produces LaCroix seltzer water, the favored drink of Millennials and “influencers” the world over. The stock has been on fire as fizzy water gains share on traditional soda companies. When the government asks for information, I find it wise to give it to them. National Beverage refused, and the stock price sprung a leak. This isn’t some random government meddling. The company’s actions raise serious concern. On the surface, it’s a blazing hot market – which means any sign that growth may be slowing or unable to meet future expectations could send the stock into a tailspin. Trust me, I know of which I speak. I’ve spent the last 20 years focused on financial statement analysis and catching aggressive management teams with their hands in the cookie jar. The No. 1 red flag is when management messes around with revenue recognition. Well, a modern company’s entire financial model flows from revenue on down. Revenue impacts profit margins, cash flow, and the strength of the balance sheet. When business is doing well and customers are eager for more product, there’s no incentive on the part of management to plays games with the top line. That mostly happens when there’s a bump in the road and management isn’t open and honest about it. That’s when they make stuff up. And, to be clear, LaCroix’s metrics are made up. The company uses a figure called “velocity per outlet” and another one called “velocity per capita” to measure sales performance. No one outside of the company knows what to do with those metrics. That’s a problem, and it’s nothing new. It probably won’t surprise you that companies do it all the time. The sweet spot for sour numbers is in the reporting of non-GAAP financial performance. GAAP is the acronym for “Generally Accepted Accounting Principles – you know, the legitimate stuff. When it comes to non-GAAP figures, there’s a lot of leeway for management to create new metrics and, in doing so, report earnings in a sparkling light. While “velocity per outlet” may look great on paper, using it in the first place is a solid red flag. The stock has now recovered most of its losses. But that doesn’t mean the concerns have gone flat. In the end maybe, it’s nothing. There’s a primary rule you should follow when it comes to stocks you own. It’s especially true for high-growth companies, where expectations might be in nosebleed territory. Every company is guilty until proven innocent. That might sound cynical. But that’s two decades of looking at these kinds of numbers talking. Management must show you – not just tell you – with its financial disclosures that everything is fine. It must demonstrate there’s no reason to be concerned, that it’s presented a true financial performance and it’s sustainable. This requires looking beyond the press release and digging deep. One of the best things you can do for yourself each quarter is to analyze your portfolio’s quality of revenue recognition and look for red flags. It’s the sort of work I do each month with my Hidden Profits recommendations. We’ve closed seven positions so far, with six winners averaging 35.35%. Our top winner’s at 56.16%. As originally appeared in The Rich Investor. Recently, I wrote about how automation is increasingly becoming a part of our lives. I’m ultimately bullish on automation in cars, not so much for my beer-drinking experience. Computers and robots have pervaded our lives at an ever-increasing rate – not always for the good. Regardless, the concept of automating just about everything is gaining steam. A 2017 report by McKinsey Global Institute forecast that half of today’s work activities could be automated by 2055. Buzzwords always crop up around the new – “disruptive” technologies, for instance. But a particular phrase attached to the automation trend really bothers me. That’s both sad and scary. It feels like our robot overlords are just steps off scene. As machines clock in on the factory floor, humans get pushed aside. The problem is humans have mortgages, energy bills, health insurance, student loan debt, food to buy, and other humans to rear. My grandfather worked for General Motors. He had three children and a stay-at-home wife. He owned a home and a car. There was food on the table. Life was not extravagant. But his family was comfortable. He and my grandmother, both products of the Great Depression, saved their money, too. In their later years, it led to a comfortable existence. They were self-sufficient. Those days are over for most people. It’s possible there’s too much of good thing. You don’t have to be a card-carrying communist to think that as humans get displaced, the risk of civil unrest rises. Automation might, in fact, make the world a much more dangerous place. The company recently announced an initiative to allow humans to run a service of up to 40 vehicles and deliver packages from 75 Amazon stations. A relatively small $10,000 investment is all that’s required. I’m sure the devil is in the details. However, if a company has “surplus vehicles,” it might make sense to work with Amazon to generate revenue when they otherwise would be sitting in the parking lot not making money. Score one for the humans! I’m bullish on the sector, ultimately. While I wouldn’t have much confidence in the technology today, it is improving rapidly. Over the long haul, we may be much safer and more productive with self-driving vehicles. In the upcoming issue of Hidden Profits, I highlight a hiding-in-plain-sight stock with a unique technology that’s gaining traction in the space. In fact, I once shorted the stock and made a substantial return as it cratered. Despite that dive, it’s still very much unloved by Wall Street. Now, I like its prospects – for very different reasons than the rationale for my bearish bet a few years ago. It just goes to show there’s no room for emotion in investing. And, when the facts change, change your mind. A company can be a disaster waiting to happen one day, only to emerge as a leader in a new industry the next. Earlier this week, when I noted the market’s bad breadth suggests lower returns ahead, I mentioned that this is occurring at the same time regulations are getting rolled back. It’s almost as if our behavior never changes, and we forget (or ignore) all the bad stuff that happened just a few years ago. That’s why 100-year storms in the market happen every 10 years. Once it looks like we’re in the clear, we allow the same problems to punch us right in the face all over again. Most of the regulatory rollback has been in the gutting of the Dodd-Frank Wall Street Reform and Consumer Protection Act. This was a key campaign promise that Donald Trump ran on during the presidential election. Dodd-Frank was passed in 2010. It was aimed at limiting the damage from banks deemed “too big to fail.” It was also meant to protect consumers from having to bail those banks out again. There haven’t been any Lehman Brothers or Bear Stearns disasters since, so now must surely be the time to loosen up the rules, right? Congress just voted to soften up the rules a bit to help out small and mid-sized banks. We’re talking banks with less than $250 billion in assets. They get a reprieve from rules they thought were expensive and onerous. These rules include stress tests, increased cash requirements, and more reporting, to name a few. While most of the story has centered on Dodd-Frank, the devil’s is in the details. The rollback of this legislation is just the first step in a broader effort to weaken the administrative state. It’s the next round of deregulation that could pose huge threats to our financial system. The Federal Reserve is getting ready to ease up on rules that allow banks to use other people’s money – your money – to make huge, risky bets. That’s the real story. Not Dodd-Frank. This type of trading works until it doesn’t. Then, the bankers walk away with millions of dollars, and Joe Sixpack gets caught holding the bag. This is where the deregulation is headed next. It could do a doozy on the economy. There are plenty of rewards for traders when things go well, such as million-dollar bonuses, but few, if any, traders go to jail when they flush the financial system right down the toilet with risky bets. We’ll end up right back where we started. Actually, we’ll end up worse off in the end. A major bank failure is practically assured. The market will implode with it. Trillions of dollars in bailouts will be given to folks that took excessive risk. It wasn’t fun the first time around, and it won’t be fun this time around. Due to the massive Federal Reserve liquidity bubble created by low interest rates, the next bear market will be one for the history books.